The House of Este /ˈɛsti/ is a European princely dynasty. It is split into two branches; the elder is known as the House of Welf-Este or House of Welf (Guelf or Guelph), and the younger is known as the House of Fulc-Este or later simply as the House of Este. The elder branch of the House of Este included the dukes of Brunswick and Lüneburg (1208–1918) and produced Britain'sHanoverian monarchs and one Emperor of Russia (Ivan VI). The younger branch of the House of Este included rulers of Ferrara (1240–1597), and Modena and Reggio (1288–1796). Hugh, issue of Azzo's second marriage to Garsend of Maine, inherited the County of Maine, his mother's dowry, but sold it one year later and died without heirs. The two surviving branches, with Duke Henry the Lion of Saxony and Bavaria on the German side, concluded an agreement in 1154 which allocated the family's Italian possessions to the younger line, the Fulc-Este, who in the course of time acquired Ferrara, Modena and Reggio. Este itself was taken over in 1275 by Padua and in 1405 (together with Padua) by Venice. George, by the Grace of God, of Great Britain, France and Ireland, King, Defender of the Faith, Prince-Elector of Hanover, Duke of Brunswick. ca. 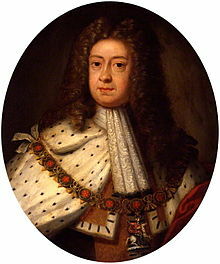 1714, the year of his succession, by Sir Godfrey Kneller. The elder branch of the House of Este, the House of Welf, historically rendered "Guelf" or "Guelph" in English, produced dukes of Bavaria (1070–1139, 1156–1180), dukes of Saxony (1138–1139, 1142–1180), a German King(1198–1218), and the dukes of Brunswick and Lüneburg (1208–1918), later styled the "Electors of Hanover" when two branches of the family recombined in 1705. After the peace ending the Napoleonic wars reshaped Europe ushering in the Modern era, the Electorate of Hanover(duchy of Brunswick and Lüneburg held in personal union by the king of Great Britain, George III) was dissolved by treaty, its lands were enlarged, and the state promoted to a kingdom. The new kingdom existed from 1815 to 1866, but upon accession of Queen Victoria (who could not inherit Hanover under the Salic law) in 1837, it passed to her uncle and thus ceased to be in personal union with the British Crown. The House of Este hence gave Great Britain and the United Kingdom the "Hanoverian monarchs" (1714–1901). Obizzo I (d. 1193), the first margrave, battled against Emperor Frederick I Barbarossa. His nephew Azzo d'Este VI(1170–1212) became podestà of Mantua and Verona. In 1146 with the last of the Adelardi Ferrara passed as thedowry of his niece the Marchesella, to Azzo VI d'Este. Azzo VII Novello was nominated podestà for his lifetime in 1242. The lordship of Ferrara was made hereditary by Obizzo II (d. 1293) who was proclaimed Lord of Ferrara in 1264, Lord of Modena 1288 and Lord of Reggio 1289. Ferrara being a papal fief, the Este family were given the position of hereditary papal vicars in 1332. Ferrara became a significant center of culture under Niccolò d'Este III (1384–1441), who received several popes with great magnificence, especially Eugene IV, who held a Council here in 1438, later known as the Council of Florence. His successors were Leonello (1407–1450) and Borso (1413–1471), who was elevated to Duke of Modena and Reggio by Emperor Frederick III in 1452 and in return received these duchies as imperial fiefs. In 1471 he received the duchy of Ferrara as papal fief from Pope Paul II, for which occasion splendid frescoes were executed at Palazzo Schifanoia. Under Ercole (1431–1505), one of the most significant patrons of the arts in late 15th and early 16th century Italy, Ferrara grew into a cultural center, renowned especially for music;Josquin des Prez worked for Duke Ercole, Jacob Obrecht came to Ferrara twice, and Antoine Brumel served as principal musician from 1505. Ercole's daughter Beatrice (1475–1497) married Ludovico Sforza, Duke of Milan, while his daughter Isabella (1474–1539) married Francesco Gonzaga, Marquess of Mantua. Ercole I's successor was his son Alfonso I (1476–1534), third husband of Lucrezia Borgia, daughter of Pope Alexander VI, sister toCesare Borgia and the patron of Ariosto. Alfonso and Lucrezia Borgia's son Ercole d'Este II (1508–1559) married Renée of France, daughter of Louis XII of France. His son Alfonso II first married Lucrezia, daughter of grand-duke Cosimo I of Tuscany, then after becoming a widower, Barbara, the sister of Maximilian II, Holy Roman Emperor (1527–1576) and finally a third wife, Margherita Gonzaga, daughter of the duke of Mantua. Though he raised the glory of Ferrara to its highest point, and was the patron of Torquato Tasso and Giovanni Battista Guarini, favouring the arts and sciences, as the princes of his house had always done, the legitimate line ended in 1597 with him. EmperorRudolph II recognized as heir his first cousin Cesare d'Este (1533–1628), member of a cadet branch born out of wedlock, who continued to rule in the imperial duchies and carried on the family name. Ferrara, on the other hand, was annexed by force of arms in 1598 by Pope Clement VIII, on grounds of the heir's illegitimacy, and incorporated into the Papal States. The last duke, Ercole III, was deposed in 1796 by the French and his two duchies became the Cispadane Republic which one year later was merged into the Cisalpine Republic and then into the Napoleonic Kingdom of Italy. Ercole was compensated in 1801 with the small principality of Breisgau in southwestern Germany, whose previous rulers, the Habsburgs, ceded it to him in anticipation of its eventual return to the Habsburgs, since Ercole's daughter Maria Beatrice Ricciarda d'Este was married to a cadet Habsburg,Archduke Ferdinand of Austria-Este. Ercole died in 1803 and Breisgau passed to his daughter and her husband, who then (1806) lost it during the Napoleonic reorganization of the western territories of the defunct Holy Roman Empire to the enlarged and elevatedGrand Duchy of Baden. In 1814, when French rule in Italy ended (but after the death of Duke Ercole), Modena was returned to his daughter Mary Beatrice and her son, Archduke Francis of Austria-Este. The family thus ruled the duchy of Modena and Reggio again from 1814 to 1859, using the names Asburgo-Este (Habsburg-Este) and Austria-Este. In 1859 the duchy lost its independence to the new united Italy, and Francis V, Duke of Modena, was deposed. Arms of the Dukes ofAustria-Este as borne by Archduke Franz Ferdinand during his lifetime. Since his own children were born in morganatic marriage (Sophie, Duchess of Hohenberg), the Habsburgs designated his soon-to-be born great-nephew Robert (b. 8 February 1915), second son of the future emperor Charles, as the next "adopted Austria-Este". Through his mother Zita of Bourbon-Parma (a great-granddaughter of Maria Teresa of Savoy, Duchess of Lucca and Parma, who was a daughter of Maria Teresa of Austria-Este, Queen of Sardinia, who in turn was a daughter of Maria Beatrice Ricciarda d'Esteand Archduke Ferdinand of Austria-Este, Duchess and Duke of Breisgau and Modena), Robert was a descendant of Ercole III d'Este, and the blood of last Este dukes thus joined again with the name Austria-Este. International format : Princes(ss) of Belgium, Archduke (Archduchess) of Austria-Este, Prince(ss) Imperial of Austria, Prince(ss) Royal of Hungary and Bohemia .